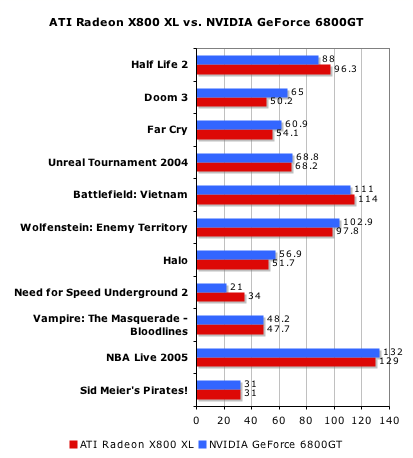 "So, is SLI worth the cost and the effort? For some, the answer will be a definite no. The SLI boards still cost a great deal, setting up the system is still a daunting task, and the cost of two top-of-the-line video cards will be just too much for many to consider SLI to be a real option." Wesley, well done, although I have to admit I skipped over some of the pages describing the individual boards as I am not personnaly intrested in buying a SLI system. using the top half of the bar for single card and the bottom for duel cards. It would also be nice to see a comparasion of disk controller, firewire and USB performance (and anything else that is chipset specific) using all the different brand chipsets. I don't think you are the person that does power supply reviews, but with all the concerns recenty about power supplies it would also be nice to see an article that not only describes some of the differences in power supplies but what components draw power from what rails and how much they draw (I have seen power supply guides that give an idea of how many total watts is needed but very little information on how those watts are divided up between rails). One last thing, I have a little problem with this statement "the ability of a motherboard to run at much higher than stock speeds tells you something about the quality of components used in a motherboard". If every motherboad had a perfect BIOS and they all had the same overclocking options then your statement could be true, but that is not the case. Would you call all Intel branded motherboards poor quality just because Intel doesn't put overclocking options in their motherboards BIOS? What if an OEM decided to use one of these great overclocking boards in a prebuilt system and the only change they made to the board was to eliminate the overclocking options from the BIOS, is that board now poor quality? Does anyone know which boards support Firewire 800 (1934b)? #43, I'm aware it needs a PHY, but I always thought it worked the same way as it did since the nForce3-250Gb, with no PCI-E involved. - 2nd PCI Express LAN supports 10/100/1000 Fast Ethernet by Marvell 88E8053"
I couldn't find a reference that the chipset LAN is tied to PCI-E.
"With regards to the overclockability, it has AI Overclock, PEG link, and other options, the extent of the overclockability was not promised and unfortunately some customers expect amazing overclocking abilities when the 1T overclock is still a good feature and is overclocking in action." Perhaps what you would expect them to say when their board clocks more than 60mhz lower than some competitors.